Can Tho's Preventive Medicine Center reported July 19 that two people from the Mekong Delta city have tested positive for cholera. A 17-year-old from Thot Not District and a 22-year-old of Co Do District are being treated at Thot Not District’s General Hospital. The patients were admitted to hospital with severe stomachaches, diarrhea and vomiting, said doctors. Elswhere in the delta, 19 people have recently suffered from cholera in An Giang Province. 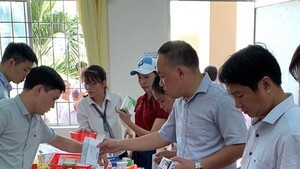 Among them, Long Xuyen City has the most with nine people, while five residents have become sick with the illness in An Phu District. Also on July 19, 200 workers from the Mekong Dream Company that manufactures stuffed toys in Tien Giang Province’s Cai Be District were hospitalized due to food poisoning symptoms. Director of Cai Be General Hospital, Bui Van Nghieu, said that the workers were brought to hospital with vomiting, headaches and dizziness after a lunch of tuna, bamboo shoots and water spinach. Most of them have already regained health. Tien Giang Province’s Department of Health asked relevant authorities to take samples of food for testing.